2.1 What are the major sub-options in marketing? 6 Who should consider marketing? 8.1 Want to work in marketing? 8.2 Think you should do something else? Spending a few years doing marketing in the private sector can teach you highly generalizable skills that can later be used in a wide range of industries and causes. You should consider marketing if you have good social and verbal skills, want a decent work life balance and want to keep your options open across causes. • Marketing is a valuable and highly transferable skillset that keeps your options open across industries and causes. • A decent chance of reaching leadership positions in companies and good preparation for entrepreneurship. • Reasonably well-paid (after a few years). • Some industries and marketing practices may be harmful. • Not as prestigious or well-paid as finance, consulting, law. Ability to communicate ideas very clearly, very social and able to get on well with a wide range of people, want decent work life balance. To get a sense of what’s involved in marketing, you can buy and read case studies used for teaching marketing at business schools, such as the Coca-Cola vs. Pepsi-Cola case. Taking classes in business, economics or statistics can increase your chances of getting a position. The best way to get a full-time position is through internships – large consumer-product companies and some tech-firms do on-campus recruitment at universities; for other industries use your network or contact firms directly. For this profile we interviewed Josh Jacobson who worked in brand management at PepsiCo and did an email interview with a user who worked in the marketing field for around 20 years. We also read the WetFeet Career Overview on Marketing, the WetFeet Insider Guide to Careers in Marketing, the relevant sections of the Occupational Outlook Handbook of the US Bureau of Labor Statistics, the marketing profiles on Vault, TargetJobs, Prospects, Oxford University and Kent University careers services, among other sources. See all our research in our wiki. Marketers help organisations to create products and services that people will want and increase the sales of existing products and services. They are often involved in creating the high-level marketing strategy for an organisation and co-ordinating its execution across a wide range of teams and departments, including product development, market research, advertising, PR and sales. Marketers work with market research and product development teams to develop products that are likely to be in demand and which the organisation is well-positioned to make and sell. They work with advertising and PR teams to communicate the value of products to potential customers and with distribution and sales teams to plan prices, packaging and distribution channels to reach their target market. Marketing is sometimes confused with advertising or PR, but marketing involves co-ordinating the overall process of identifying what products to make, how to promote them, and how to sell them, not just specific promotion channels. This 2 minute video explains more on what marketing is. What are the major sub-options in marketing? Note that there are market research roles also in client-side marketing in larger organisations. In the rest of this profile we focus on client-side marketing in the private sector. The usual path in client side marketing is to start as a Marketing Associate/Assistant (Brand Assistant in Consumer Packaged Goods), then if you are successful you can become a Marketing Manager (Brand Manager), and then a Marketing Director. Some experienced marketers leave client-side marketing to join marketing consultancies or start their own consultancies, and some reach senior leadership positions in their firms. What are the daily activities of a marketing employee? Marketers often play a key role in influencing the strategy of organisations — marketing directors are often board members and get to influence corporate decisions and business strategy.2 Marketing also often leads into general management and senior executive roles, which give scope for even more influence and high compensation. 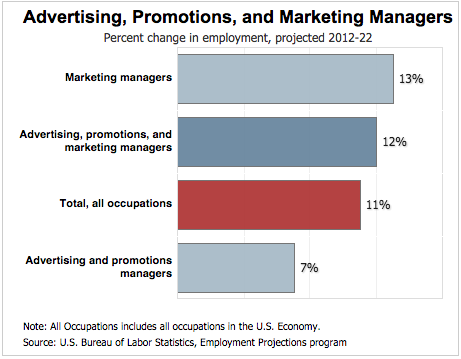 The US Bureau of Labour Statistics projects that from 2012 to 2022 there will be a 13% increase in the number of marketing managers (about the same as all occupations) and a 32% increase in market research analysts (who do more statistics and data analysis than other marketers). If you do marketing in an industry that’s harmful (e.g. alcohol, tobacco, parts of finance and law), then you’ll be contributing to the harms caused by that industry. But marketing as an activity may be harmful in some cases even independent of whether the product or service you are marketing has negative externalities. If marketing changes consumer tastes in a spurious way (e.g. by deception), it can increase the prices of products beyond the marginal benefit to the consumer, reducing consumer surplus, as well as increasing the barriers to entry to markets and making markets less competitive.5 There is evidence of this occurring in the pharmaceutical and sub-prime mortgage industries.6 On the other hand, in some cases marketing may serve a useful function — it can provide accurate information to consumers about the existence, price and quality of products, which promotes competition among established firms and helps new firms enter markets.7 The impact of marketing in general is unclear, and a lot depends on what you are marketing. The cultures in private sector firms are focused around the aim of increasing company profits, and there is little or no emphasis on considering social impact. Spending a lot of time in an environment like this can over time reduce your altruistic motivation. Marketing roles aren’t as prestigious as roles in finance, consulting and law, meaning that these roles are less useful as a general purpose credential. Moreover, the network you gain access to is likely not as strong. The pay is also lower. Outside of quantitative market research, marketing roles are generally open to graduates with any degree, but majors that demonstrate a strong interest in marketing such as business or economics are helpful for increasing your chances of getting in. 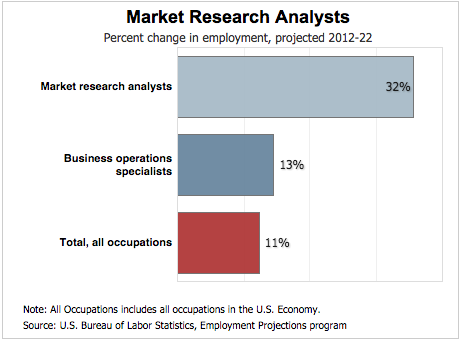 For market research roles, social sciences degrees and statistics classes are usually required. Top consumer-product companies do on-campus recruitment and it is difficult to get interviews if a company doesn’t recruit at your university – so find out which companies recruit from your university to get a sense of whether this is a realistic option for you. Companies are looking for people who can think and communicate very clearly — interviewers are unlikely to give you a job if they can’t follow your train of thought easily. Marketing roles tend to have very social atmospheres, so being able to get on well with a wide range of people and generally being likeable is also important for getting a position. You want to gain experience in business strategy and/or you are considering entrepreneurship. To get a sense of what’s involved in marketing, you can buy and read case studies used for teaching marketing at business schools, such as the Coca-Cola vs. Pepsi-Cola case. If you are still at university and want to go into brand management or market research, you increase your chances by taking classes in business, economics or statistics, rather than having a purely humanities degree.8 At universities where you can major in business as an undergraduate (e.g. University of Pennsylvania), you can take a brand management class. You also increase your chances of getting a position by demonstrating a strong interest in marketing by paying a lot of attention to what is happening in the marketing world, for example by subscribing to marketing and advertising publications, and developing opinions on current marketing strategies and advertising campaigns.